The name of the town is immersed in the exotic. The capital of the U.S. state of Hawaii is an oasis of the North American continent. 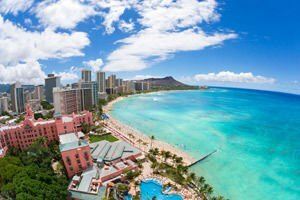 For the average American, a trip to Honolulu is tantamount to visiting a foreign land, although still at home. Honolulu is among the most attractive destinations in the world. The city is located on the island of Oahu. In translation from Hawaiian, the name of the city means "sheltered bay", one of the city’s most famous nicknames. Honolulu is the largest city in the south-western U.S. territories. Honolulu is today an example of a rich culture, into which the traditions of many immigrant communities living in the U.S. state fit well. In Honolulu are the most gorgeous scenes and the hottest nightlife. The capital of Hawaii is a place of exotic and violent emotions. Honolulu , however, has retained a bitter memory of one of the most startling events in U.S. history - the attack on Pearl Harbour, in 1941. The port now has a magnificent monument – the USS Arizona Memorial, erected in honour of the 1, 102 killed in the bombing. More than one million people annually visit the obelisk. Access to it is only through a vessel, inside the memorial, visitors can learn details about the event that led to U.S. involvement in World War II. 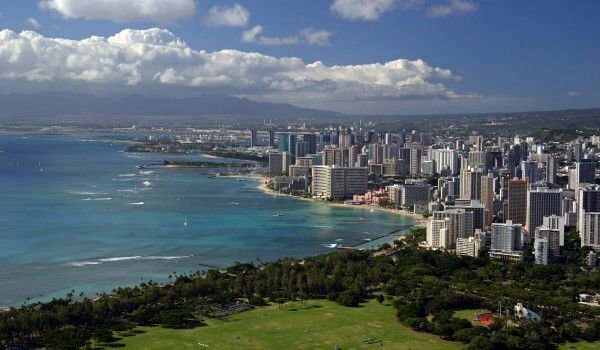 Honolulu - the home town of Barack Obama, is a major financial centre among the islands of the Pacific Ocean. The industrial part of town is in no way from other state capitals. Among the tallest buildings in downtown are Aloha Tower, 134 meters high, and First Hawaiian Center (131 meters tall). The largest arena in the state of Hawaii is called Aloha Stadium. The vast facility accommodates more than 50, 000 people. It is home to sports teams of local universities, as well as many visiting teams. Near the centre of town is the government's Iolani Palace - the only royal palace, former residence of the monarch, which is today formally occupied by U.S. authorities. Like this building is another historical landmark, located nearby. It's the Aliiōlani Hale – a beautiful building, which houses the Supreme Court of the State of Hawaii. Court is famous for gilded statue "Kamehameha" - the monarch who founded the Kingdom of Hawaii. The monument was erected in 1878 to commemorate the 100th anniversary of the arrival of British explorer Captain Cook on the island. In the Arts District neighbourhood, many cultural institutions are concentrated in Hawaii. There you can find attractive galleries and the local theatre. One of the most visited places in town is the Bishop Museum, which stores the largest collection of Polynesian cultural and scientific artefacts. Access fee is 14.95 to 17.95 dollars. In Honolulu are some breath-taking landmarks – like Diamond Head. The crater was formed about 300 000 years ago. The frozen volcano is situated on the banks of world famous Waikiki beach of Hawaii (Waikiki's coastline). As a result of volcanic activity, another city landmark of Hawaii was formed - Hanauma Bay. Another highly visited place is the Honolulu Zoo. There you can see exotic animals in their natural environment, like the most impressive birds and flamingos. Ocean lovers can see amazing aquatic creatures in the Waikiki Aquarium. The facility is considered one of the oldest in the U.S. Among the shopping centres where you can get original souvenirs and many other memories of Honolulu , an extremely popular is the largest outdoor mall, the Ala Moana Center. Closest to Honolulu, separated by 3787 km, is the city of Point Arena. Approximately the same distance and are the Aleutian Islands too.